Another on point project from Berlin's creative record store hub OYE! Following a sun soaked day on a trip to Tel Aviv, OYE counter culturist Delfonic wandered into an intriguing spot called Kuli Alma. Coincidentally Berlin based Tel Avivian Moscoman was playing at the club that very afternoon. Call it fate, call it afternoon drinking, call it sun stroke - whatever the reason, after a mind-blowing track dropped, he asked Moscoman about its origin, and not so long after, Disco Halal was born. This fresh label dedicated to Middle eastern and Oriental sounds, is gonna hit us with a string of originals and edits from artists such as Acid Arab, Memhet Aslan, Red Axes, Naduve, Autarkic and Moscoman himself, so make room in your collection! Volume 1 features a trio of edits alive with those hypnotic and psychedelic touches which are so central to middle eastern music. 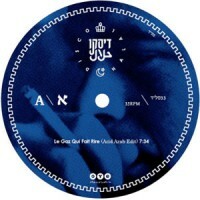 Acid Arab kick us off with the blistering electro-tech and 303 sequences of "Le Gaz Qui Fait Rire", a mindbending collision of tradional folk violins and vocals with all out club filth! On the flip Autrakic calms things down a little with the bordeline Balearic dub of "Palgey", a lilting lullaby with a touch of synth strings which could only come from the coast of North Africa. Last but not least, Mehmet Aslan drops "Yasadim", a beefed up house rework of a traditional Turkrock groove which balances a thumping bottom end with the high register strumming of the Baglama Saz. Exotic, inventive and addictive, Disco Halal looks set to make an instant impression on the dance music world.